I lately acquired this Monarch portable typewriter, and learned it was owned by a sportswriter for the San Francisco Examiner back in the 1940s. It’s been sitting in a garage for the last 40 years, so the owner is grateful it will be placed (and appreciated) in a private collection. The Monarch is a name variant of the Remington Compact Portable, which was produced between 1930 and 1938 (source). 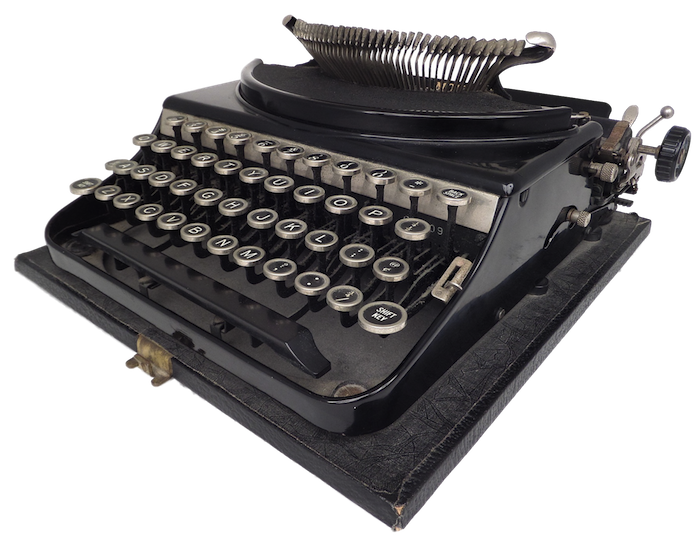 It was modeled after the Remington Portable #2, but has a nickel-plated strip above the keyboard. Like other early Remington portables the Monarch employs a folding mechanism for lowering the typebars. The plate below is textured. My typewriter has the serial number C60093, indicating it was manufactured in 1936. This typewriter will occupy a special place in my collection as my grandfather was also a sportswriter — only, we don’t have his old typer, which was probably a Remington. My grandfather, Tex Adams, wrote for the Sporting News in Ponoma Valley, which is distinct from the nationally syndicated newspaper of the same name. Tex penned a boxing column called “Punching the Bag” — view scan here. 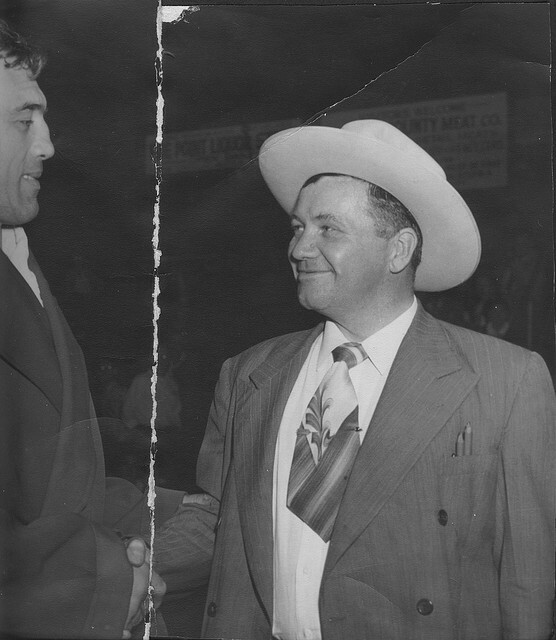 Tex also promoted boxing and wrestling in Los Angeles, once organizing an exhibition match between Primo Carnera and some other (much lighter) boxer. In the field of wrestling, Gorgeous George sometimes graced Tex’s arena — my father remembers receiving a “Georgie Pin” as a kid. Tex is also known for helping to establish Alcoholics Anonymous in Southern California. However his sister Sybil Corwin is more well known, having survived her brother by some decades. Tex died in the 1950s from heart failure. Sybil kept her brother’s memory alive in the many talks she gave until her death in the 1990s. She is regarded as the first woman member of A.A. on the West Coast. By the way, I sometimes receive an occasional e-mail from old-timers who fondly remember Tex and Sybil. © 2013 – 2014, Mark Adams. All rights reserved. Beautiful photo and good stories about Tex.